Okay, maternity leave is dangerous for my bank balance. I've literally spent my first week off browsing the Internet for things that I don't need. My latest purchases have come from Fragrance Direct. 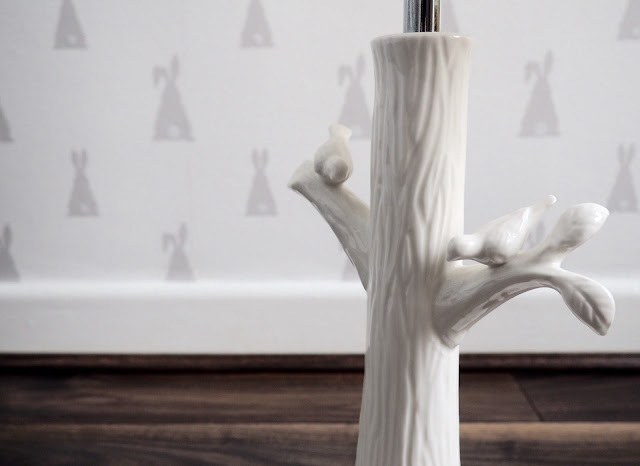 I'm actually obsessed with the FD website and always find so many good bargains and this time was no exception. This haul saw me picking up a good variety of nail varnish- I can't have nice nails whilst I'm off work, so I'm making the most of it! All of the polishes were under £3 which is an absolute steal for the likes of Jessica and Essie nail polish. I can't wait to try the Maybelline nail varnish, which was actually a recommendation from another blogger- hello rose gold nails! I ordered two lipsticks, one from Rimmel and the other is a L'Oreal number. They're both pretty pinks, but I think the Rimmel shade is more my colour. These were both less than £3 too, and I'm pretty sure they're still full price in the drugstore. Finally some miscellaneous bits. I picked up a Tanya Burr lipgloss, a little late to the game but I thought I'd give it a go for £1.25. 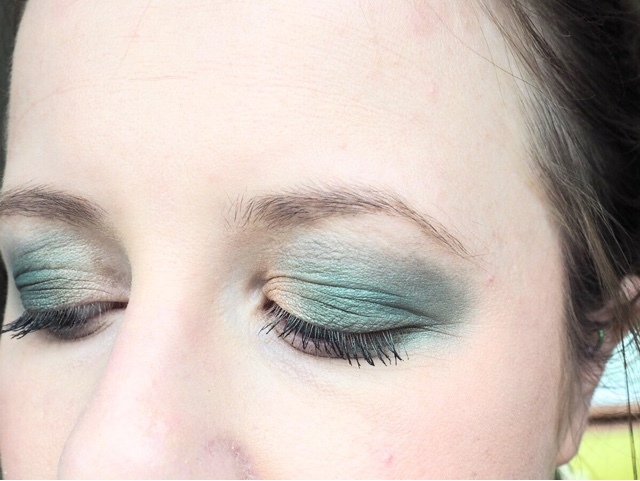 A L'Oreal eyeshadow, which I am completely and utterly in love with and I now need to order more. And finally a BB Blush which I'm a little fearful of, but I need to give it a proper go when I'm not leaving the house! My entire haul came to just under £20! For the amount of branded products, I'm super impressed with Fragrance Direct, as always. One of the things I've struggled with since being pregnant, is finding things that are flattering over my bump. 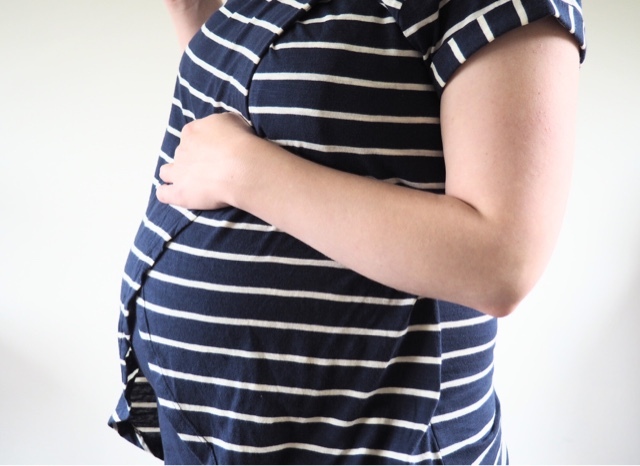 I've exhausted all of my "normal" clothes and now at 33 weeks, I have to bite the bullet and wear maternity clothes. 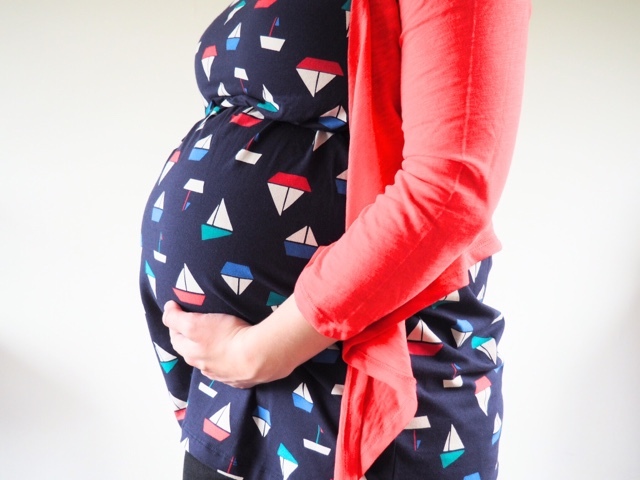 Thankfully Frugi* recently came to the rescue and revamped my maternity wardrobe. First up is this navy and white striped Swoop top. I've seen a few tops in this style but none with the built in nursing top option. 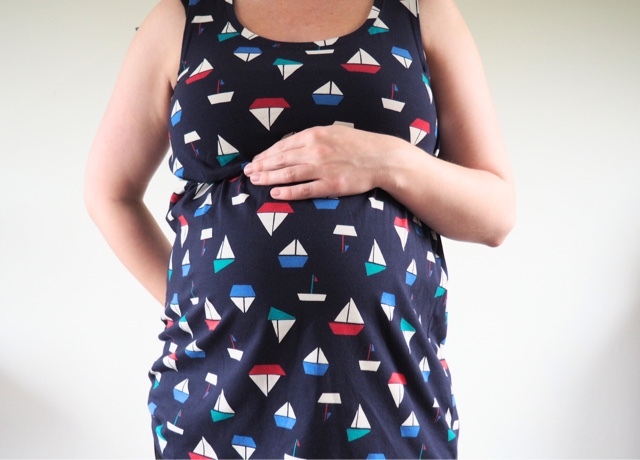 This is a gorgeous tee for pre and post pregnancy and allows easy access for breastfeeding when baby A arrives. 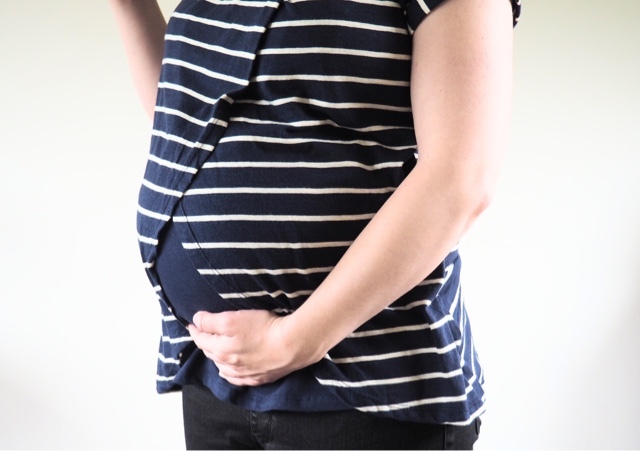 The quality of this top is amazing, made from super soft organic cotton and doesn't make my bump itch! 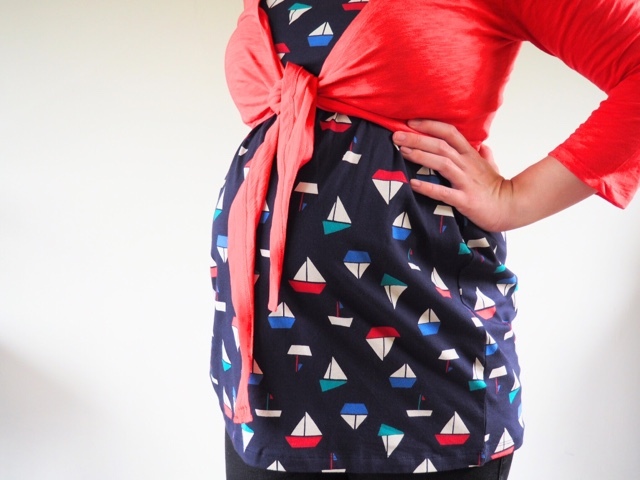 The second nursing top I chose, is this cute boat print vest with matching wrap cardigan. This nips in just above my bump, making it super flattering and doesn't make me look huge. It's a really fun print for summer time and really easy to wear. This again has a secret nursing "flap" hidden to give easy access for breastfeeding but also modesty for me. I'm so glad I finally have a few bits that I feel comfortable in and I can move from bump to nursing without worrying about my wardrobe! I have a confession, I'm kind of obsessed with Depop. I could scroll through make up for hours on end and spend way more money than I intended. I'm the queen of bargain hunting and I've managed to pick up some pretty amazing buys over the past few months. 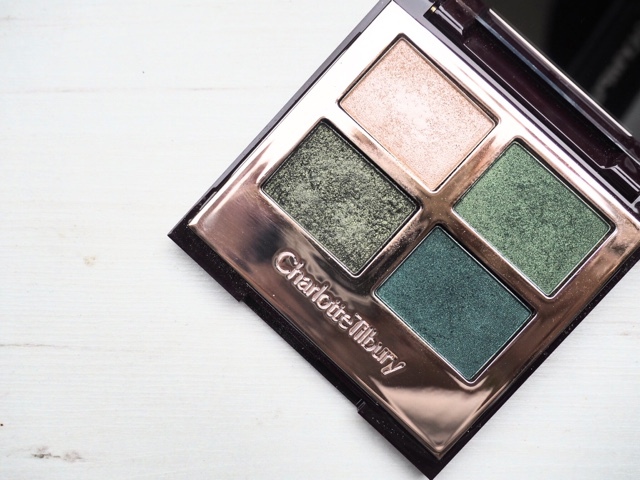 My most recent bargain comes in the form of this Charlotte Tilbury eyeshadow palette in The Rebel, which I have lusted after for forever. Green is my favourite colour so this is my ideal palette. I have two other CT eyeshadow palettes so I knew the quality of this would be amazing. And I have to say, it certainly does not disappoint. The shades are gorgeous and incredibly pigmented and buttery. The colours are a little more adventurous than I would usually wear day-to-day but that sort of makes me love it more. All of the CT palettes are super easy to use and the shadows are so blendable they're fool proof. I get so much wear out of my other palettes, I know I will get tonnes of wear from this one too. Online these are priced at £38 but I managed to pick this up for £22 including postage! It's been used a handful of times and is in perfect condition. I can't wait to play around with this a little more and create some pretty make up looks! Have you got any Depop bargains recently? Fifi Lapin at Mamas & Papas + Giveaway. I'm sorry if babies aren't your thing, but my life is pretty much revolving around planning and preparing for baby A's arrival. We've managed to pick up most things and the nursery is almost finished - babies are super expensive even before they're here! My absolute favourite thing about baby shopping is all of the adorable clothes. I swear my little lady has more clothes ready for her wardrobe, than I do. But they are just too hard to resist. When Mamas & Papas asked if I would like some of their Fifi Lapin* from the baby clothing range for my little one, I jumped at the chance. F you've followed me for a long time, you'll know I have a huge obsession with rabbits, so this range is actually my idea of perfection. In fact, I'm pretty upset they don't come in adult sizes. My hubby isn't a big fan of "character" clothing but he is absolutely in love with the adorable denim-look romper. 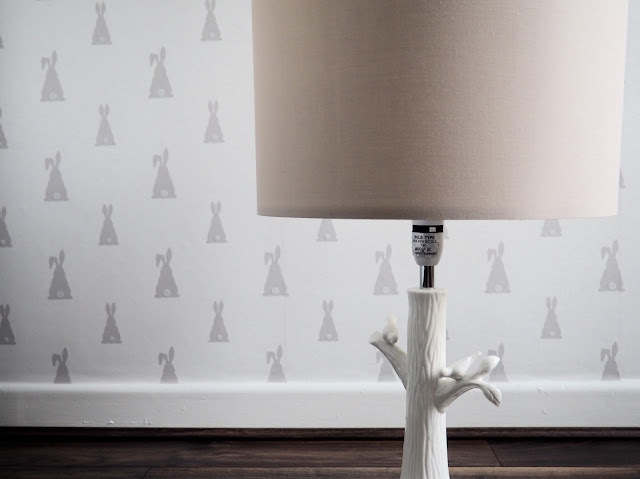 The little rabbit is super subtle and is just too adorable with the star print and pink edging. This will look perfect with a little white body suit and a cute cardigan. The second piece stole my heart immediately. The little collar is just the sweetest and I can just imagine this matched perfectly with a little skirt and some thick tights. I can't wait to dress buba up in this and show her off to the world. Mamas & Papas kindly sent me another outfit from the Fifi Lapin range for me to giveaway! If you pop over to my Twitter (@Golddust_katie), you'll find a photo of the outfit. All you need to do is follow and re-tweet the photo to entire. The outfit is aged 2-3 and is just adorable. Giveaway ends on 27th June, so get retweeting! Recently I've found some pretty amazing finds in TKMaxx. I've browsed a few stores and managed to pick up some beauty and skincare gems. So without further ado, here's a few bits I've managed to find in the last few weeks. These are probably my favourite purchase from TKMaxx in a long time. I've heard so many great things about Korean skincare brands, so when I spotted these from The Creme Shop, I needed to try. Both boxes contain five sheet masks, both saturated with product. The first box I picked up was the Coconut Oil infused masks. These smell incredible and are so soothing on the skin. These are amazing at rehydrating my skin, without making me break out. The other pack I grabbed are the Rose Water infused masks, which again smell perfect. These are brightening and soothing on my skin and the ultimate indulgent face mask. A pack of five are priced at £5.99 which makes them a pretty amazing bargain. Plus there is a variety of different types of mask, so there certainly is one for everybody! 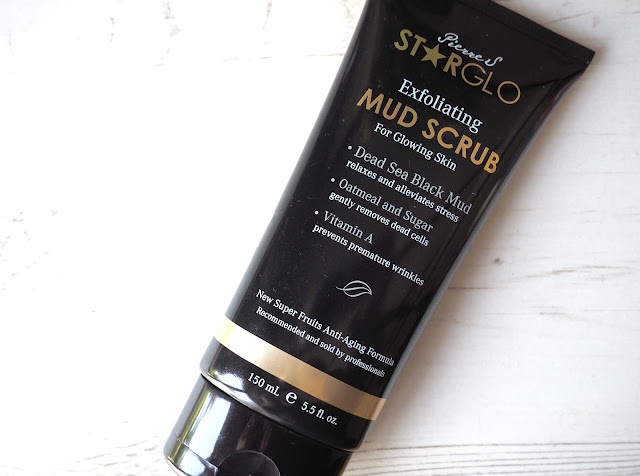 My next skin care purchase is this Exfoliating Mud Scrub from a brand called Starglo. The packaging and scrub was very GlamGlow-esque so I thought for £3.99 for a huge 150ml, it was worth a try. I've been super impressed with this scrub and I've been doubling it up as a quick 5 minute mask too. The scrub contains black mud, oatmeal and sugar and is really therapeutic to use. I hate scrubs with huge beads but this scrub is finely milled and leaves my skin super smooth. Finally I made my first every Physicians Formula purchase. I picked up this pretty bronzer/blusher, made for pale skin. I love the mosaic pattern and swirling my brush around picks up all of the colours. Best in mind that this does have some shimmer in it, so if you're not into the whole glowy look, I would probably stay clear of this one. Having said that, it doubles up as the perfect highlight shade if you're looking for a triple-threat product. This huge pan of product cost a tiny £3.99 and is an absolute must for the summer and will look incredible with sun kissed skin. Have you found any bargains in TKMAxx recently? The last few weeks my house has resembled something close to a building site. My entire home has been turned upside down with decorating and plastering and I'm desperate to get back to normality. The only room in my house that looks remotely livable is my beautiful nursery. My dad came over a few weeks back to help decorate the baby's room and I'm completely obsessed. I don't want to show too much of it yet as its not quite finished but I wanted to share this gorgeous lamp from Iconic Lights*. 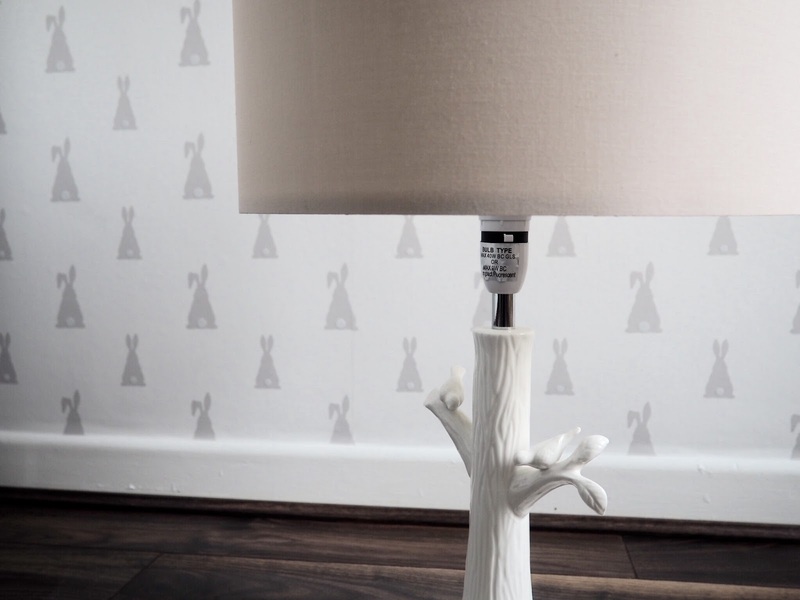 We've gone for a really neutral colour palette and this lamp is the perfect addition to the room. I wanted something that meant I didn't need to use the "big light" for night time feeds and just for general chill time with baby A. 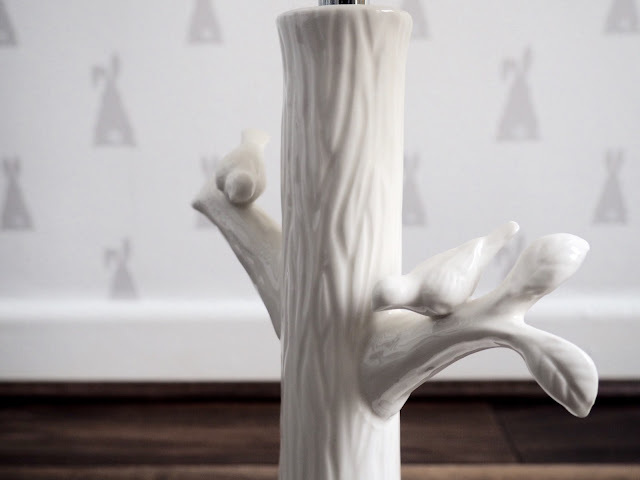 The lamp is really well made, with a ceramic tree trunk stand and a huge lamp shade. I love the sweet bird detail, which is just adorable, ready for my pretty little girl. I can't wait to share photos of the nursery when it's all finished, but if you follow me on Instagram you may have seen a sneak peak. And I'm even more excited for baby to see it for herself in a few weeks time. I recently blogged about heading to the new Lush Arndale store in Manchester. I love the new store and have been back a few times since it opened and I am completely obsessed with the make up range. At the launch party I was introduced to the Lush make up range, which I had never discovered before and now I'm addicted. At the opening I actually picked up on of the Lush eye powders in Skilled. I speant ages choosing the right shade and eventually picked this gorgeous deep pink, unicorn-esque colour. I adore the texture of the eye powders and the pigmentation is incredible. These are designed to be used as a eye shadow however I use these as a highlighter too. The finish is perfect and because of the powder texture, it's so easy to blend out and leave a natural glow. 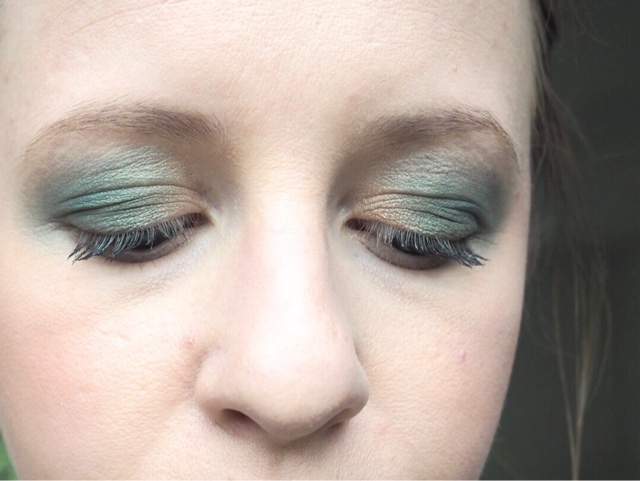 The powders can be used dry and wet (as shown in the final photo), using them wet does intensify the pigment and leaves a more "cream-shadow" finish in the lids. I managed to pick up the shade Dream from Depop for half price and I've been hooked ever since. This is the perfect shade for adding a little shimmer to your look. I've been using this as a highlighter too, as well as popping this in the centre of my lids when I've finished my eye shadow look. This is the perfect colour for anyone who's a little afraid of glitter but want something a little bit more special for that day to night look. As these are Lush products the range is not packed full of nasties and is really gentle on sensitive skin like mine. 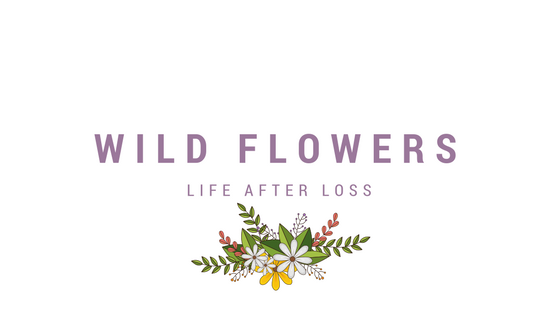 The products are vegan friendly too! Unfortunately I can't find these on the website but they are available in store at the Manchester Arndale branch and London Oxford Street so if you're passing, I would certainly recommend having a play around with these. Trust me, you won't regret it. Last week myself and my hubby were invited down to Prezzo in Manchester to try out the new summer menu. 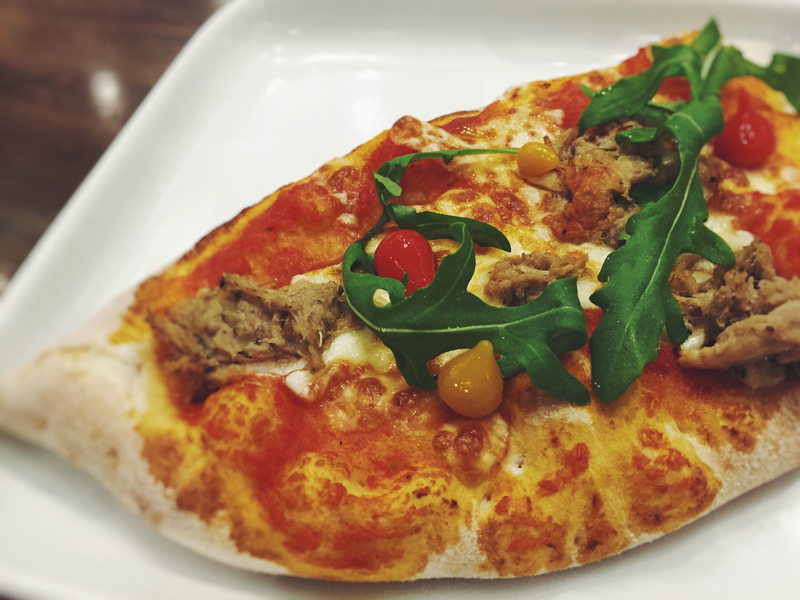 I've only eaten at Prezzo once before, so I was really looking forward to seeing what they had in store. Thankfully Prezzo have a great gluten free range so there was plenty for me to choose from! I always forget how quickly I get full now my stomach is squished by my bump, but I managed to squeeze in the three courses! My hubby started with the N'Duja Pizette which is a cute flatbread with mini peppers, sausage and cheese. It was the perfect size for a starter but I think could have easily been the perfect share size for a smaller pre-meal bite. Unfortunately there wasn't a great deal of options gluten free-wise for a starter. I'm not a huge fan of salads, so I actually ordered off the sides menu. 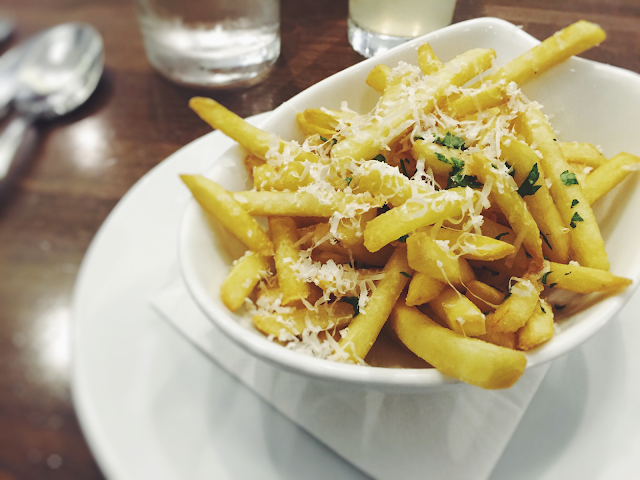 I went with the Truffle Oil Infused Fries (these aren't suitable for coeliacs cos they're fried in a shared fryer). These were super garlicky but good none the less. I'm not sure if I'd choose these again as they were a little over powering for my delicate taste buds but that could well be related to my sensitive pregnancy nose! Next up, mains. 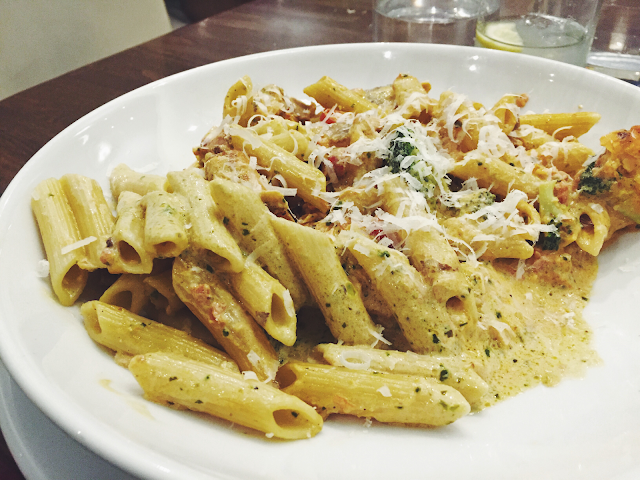 Jonathan went with the Penne Con Salmone, which as the name would suggest is a salmon pasta dish. He really enjoyed this main and I must say, it smelt pretty good! The portion size was great too as I sometimes feel pasta dishes can be a little over priced compared to pizza! Of course I couldn't go to an Italian and not try the gluten free pizza base. I've tried pretty much all of the chain restaurants GF bases and this one was pretty good. If you've eaten at Pizza Express, this base is very similar. 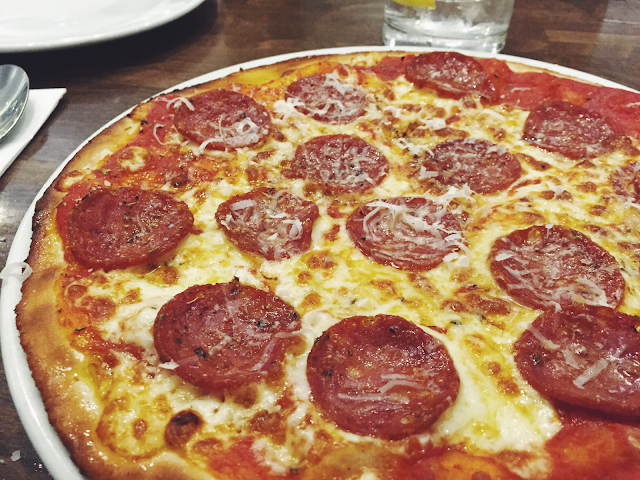 I picked the Vesuvio pizza which is a pepperoni and chilli pizza. If you like you're pepperoni with a little kick of heat, you'll love this. I'm loving spice at the moment so I really enjoyed this pizza. I would definitely recommend getting some tap water alongside this to cool down your mouth! Finally my favourite part of any meal - dessert. There is surprisingly a pretty good offering for GF diners and not his the usual ice cream. Jonathan went with the non-GF option of White Peach & Amaretti cheesecake which was recommend by the waiter. I didn't get much of a review from him as it was wolfed down in seconds, but I think I can safely say he enjoyed it. 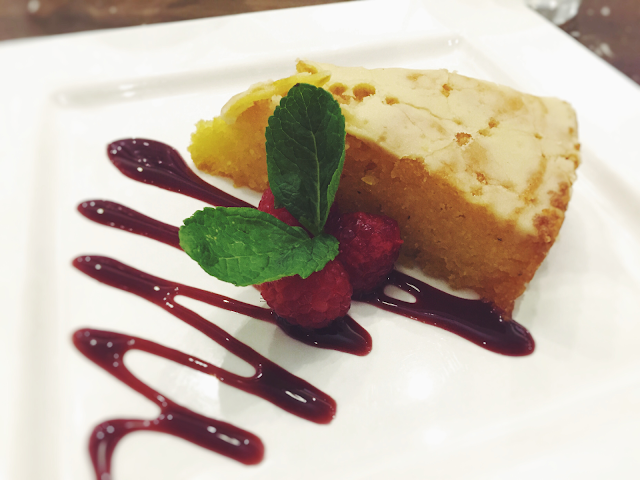 I went with the Blood Orange Polenta cake off the new summer menu and it was delicious. I adore polenta cake because it's like eating "real" cake but a little lighter. This was super yummy and refreshing and went perfectly with the raspberry coulis. 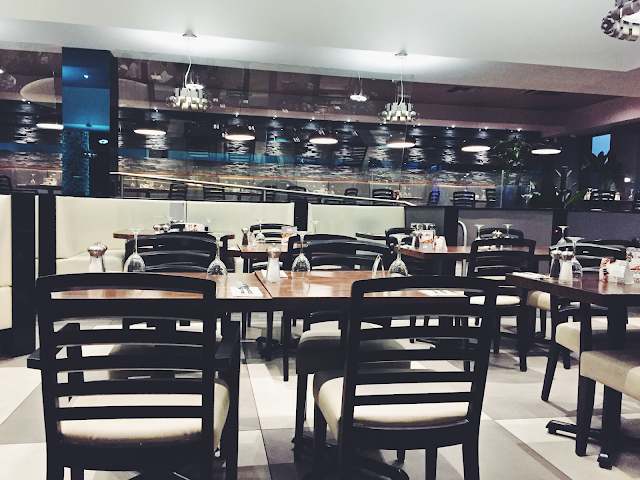 Thank you Prezzo Printworks for having us and letting us experience the new summer menu. We will certainly be popping back soon! *We were kindly given this meal complimentary, however all opinions me are my own. 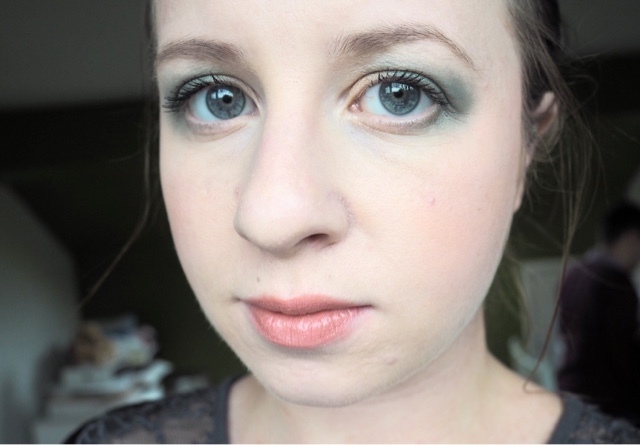 Alice in Wonderland by Urban Decay. Decay. 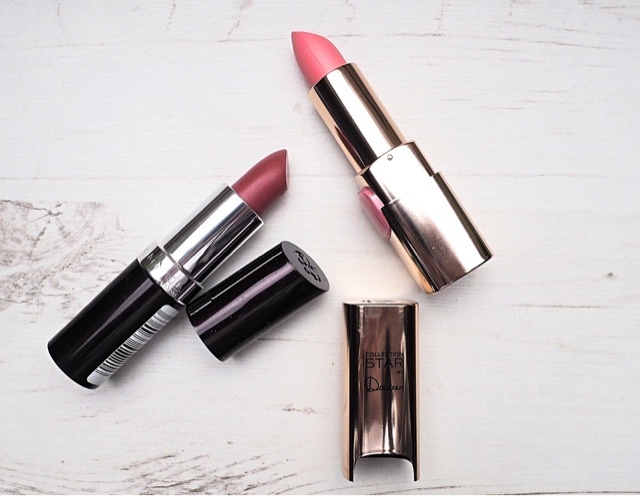 Alongside the palette I was also kindly sent two of the incredible lipsticks* from the same range. So what do I think about the collection? This is totally up my street. The packaging is amazing and has been so well thought through. The palette just feels so unique and special and the lipsticks are just gorgeous. 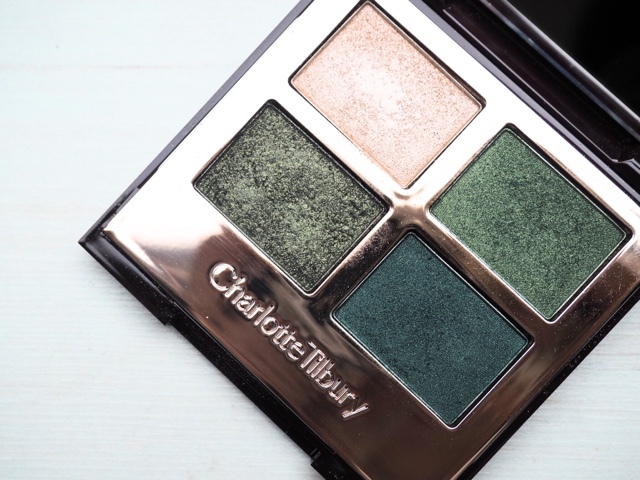 I was a little sceptical at first when I saw other bloggers talking about the range and thought I would never wear some of the eyeshadow colours, but in "real life" the shades are super pretty and pigmented, I feel confident in trying something new. 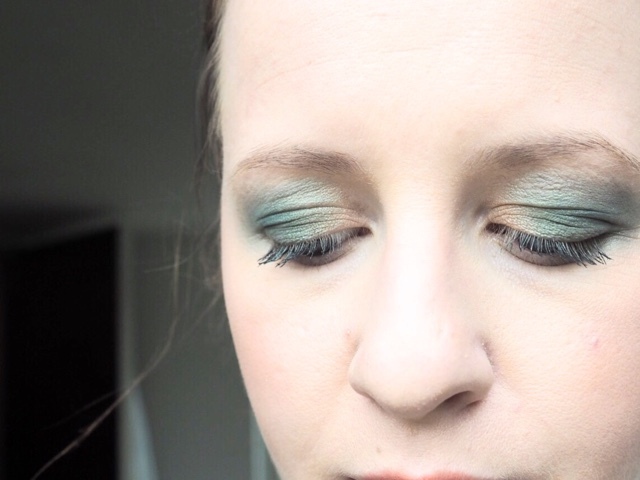 My favourite shades from the palette so far are Lily, Duchess, Kingdom, Paradox and Dream On. Lily is the most incredible highlight shade. I've been using this below my brow bone and even on the tops of my cheeks as a highlighter. It has a gorgeous iridescent sheen to it, that just makes any shade "pop" if applied over the top. Duchess, Kingdom and Paradox have been my go-to everyday shades. They seem to come together perfectly as a subtle smokey eye and have a sweet pinky tone which I wouldn't usually go for, but it works really well. Dream On is the perfect top shade to add a little shimmer but not something over the top. 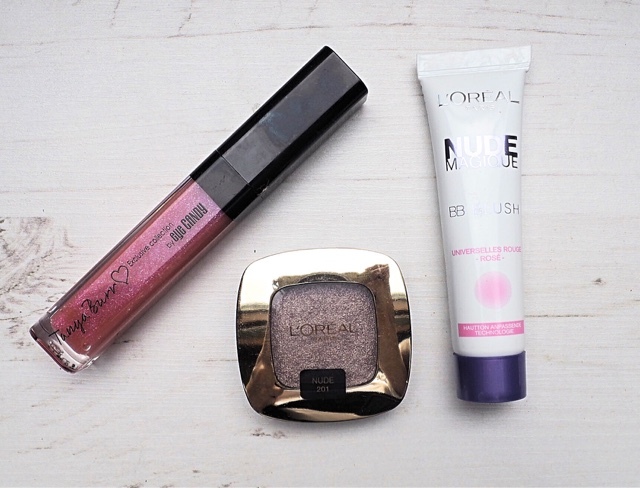 I love the purple undertones, which really compliment my skin tone and eye colour. It definitely a shade I will use over and over again, especially for a night time look. The lipsticks I received are the shades Iracebeth which is the comfort matte red shade, and Mirana which is a metalizzed purple shade. As you can imagine both shades are incredibly pigmented and super easy to apply. Iracebeth is perfect cherry red shade and is unlike any other red lipstick I own. I love that then matte formula doesn't mean it's drying and in fact is really comfortable on the lips. Mirana is a beautiful deep purple shade with a slight hint of shimmer. This works so well for a bold, statement lip but can also be applied lightly for a more sheer finish. Overall I'm super impressed with the collection, once again Urban Decay have stood out from the crowd and created something extra special.